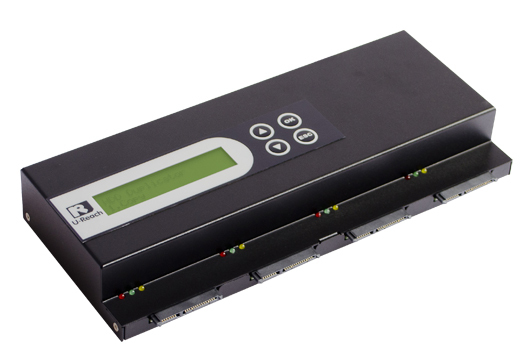 Legend series is the first SSD/HDD duplicator that supports flexible target expansion and multiple interfaces devices. With advanced Free-Chain technology, Legend series can be not only a 3-target duplicator, but a 119-target duplicator by hooking 30 duplicator systems up. Besides, by adding a variety of adapter cards, Legend series becomes a superman for supporting up to 9 kinds of popular SSD/HDDs, including mSATA, eSATA, 2.5" SATA, 3.5" SATA, CF, iVDR, 2.5" IDE , 3.5" IDE, and etc. 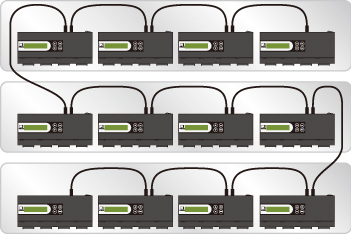 To sum up, the more Legend series duplicators you use, the more efficient your production is! Quick Copy, All Partitions, and Whole HDD copy. If you have a big capacity 2TB HDD which only has 200GB data inside, Quick Copy can help reduce the duplication time from 5.6 hours to 33 minutes. It will not copy the empty space. This mode can identify the HDD formats of FAT16/32, NTFS, and Linux(EXT2/EXT3/EXT4). It will only copy the data and system contained area, which enhances the copying efficiency very much. Comply with the U.S. Department of Defense's standard of erasing. It is important to make sure the data inside the disregarded HDD will not be retrieved and can be safely transferred. 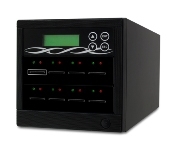 The duplicator allows HDDs with different capacities to copy each other. If a smaller source HDD is copied by a larger target HDD, after duplication, the untouched space is allowed to repartition for further use. The very special hardware bit-for-bit "Compare" function is the most secure way to 100% guaranteed accuracy of data duplication. It takes the same speed as copying. There is no other duplicator that can do such a performance so fast and accurate. Very simple and easy to use. It doesn't require a high level of expertise for operation. 1. Leading-edge technology-"Free Chain" makes production more efficient as more Legend series are hooked up! 2. Copy large volume of targets simultaneously without slowing down the speed. 3. Compatible with various file system format including 3TB advanced format HDD. 4. 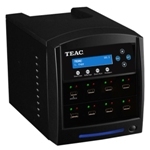 Automatic power control to protect HDD from any damage during the insertion and removal. 5. 3.9GB/m(Legend 600) and 7GB/m(Legend 1200) in copy, compare and erase operations. 6. Easy firmware update without complex procedure. 7. Instant power on and off. Easy to boot up without waiting time. 8. Standalone, no PC required.